Providing you the best range of electric motor with effective & timely delivery. 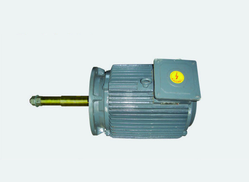 With the constant support of our expert team, we are engaged in offering a huge assortment of Electric Motor.These are specially designed motors that are totally enclosed vertical flange mounted with the extended threaded shaft and sealed top is used in the cooling tower. The motor is having weather proof IP-55 degree of protection, suitable for hot and humid atmosphere.